Somewhat disappointed in the time it is taking to judge this competition and that at least 4 of the entries appear to not comply with the date requirements of the monthly competition I have decided to remove my submission. I find it really depressing that both the recent weekly competition and now this monthly competition appear to have fallen apart after what I believe has been a long unbroken run in both sets. When these competitions first started you could expect to see around 30 entries in each competition. However In recent years it has been harder to attract more than ten. I think having to wait more than a day or two to see the results certainly does not help. Apologies for neglecting to check the dates, which has now been done. The usual plan is to do these before the end of the competition, but it got missed this time. It's a shame we're having to wait, but it doesn't happen every month and there may well be a good reason that we don't know about, so I'm not being too hasty to judge the judge! No doubt it will be sorted soon, but if not then we'll make arrangements. Seems the judge might not have remembered to judge his remembrance competition. The site shows he logged into the site on 2nd December but hasn't posted anything since November 9th when he was having something of a sell off. Trust he is OK.
We haven't been able to get a response from Billdad, so hope things are OK. However, there is now a winner selected and many thanks to our IT Guru Rick Hanson for stepping up to select our winner! So congratulations to Nigelk, who is now invited to set our next Monthly Competition. In the absence of Billdad, hope he's well and everything's ok, I've stepped in personally judged the competition. Some great images were entered which make you stop and think about the sacrifices made for our today. 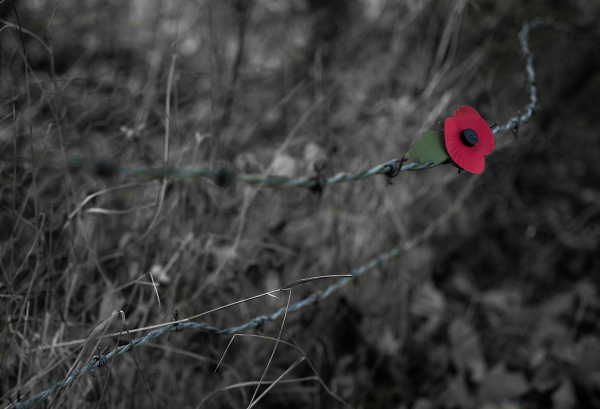 It was a close run thing between a couple of them, but for me the darkness of the image, harshness of the barbwire and the symbolic poppy made it stand out. Congratulations NigelK on entering a great image! That would have been my choice if I'd set it... wonderfully evocative image! And created for the comp, too! Thank you for sorting things out Team. Thank you Rick for the winning spot and Tim for your kind sentiments re my image. Having read quite a bit about the use of barbed wire in the first world war which inspired me to make a sculptural piece and my entry for this competition.